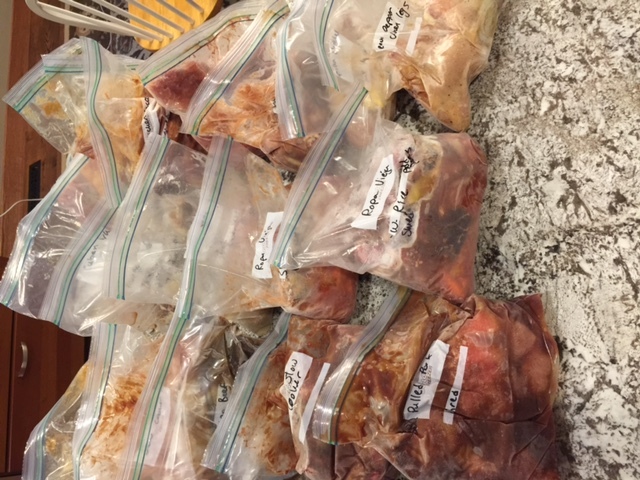 I have made this slow cooker meal plan twice, and love the simplicity of freezer dump meals! You dump a freezer bag into the slow cooker, set it on low and come home to a main entree that everyone in my house will eat. These meals are sized for a family of four and I changed the original recipes so they had more flavor. I wrote how I serve every entree, some are over rice, others over mashed potatoes, noodles, on buns or tortillas. I packaged them all in Freezer Bags that I write the instructions and additions to the recipe on the bag prior to filling. I set the bags in a square tuperwear, so they don’t tip over while filling. 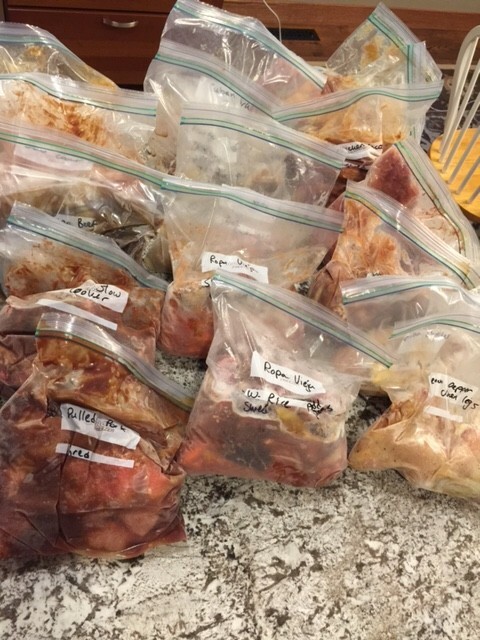 Learn from my mistake, try to freeze the bags flat so you can save space in your freezer. You could do this by using a cookie sheet or separating bags with cardboard or a thin cutting board between bags until they are froze stiff. All of these items I purchased at Aldi and I spent under $110 for 19 freezer meals. You don’t like Aldi’s store brand stuff? Did you know that Aldi’s meat is Tyson and Hormel but with Aldi’s packaging? You can even buy natural organic products there, but if you insist on spending more, go ahead and buy the ingredients at your favorite grocery store. 2 lbs. chuck roast, trimmed of excess fat. Combine beef, soy sauce, water, brown sugar, garlic and ginger in the slow cooker. Cook on low for 8-10 hours. Remove the meat from the liquid and place on a cutting board. Shred meat and remove any excess fat. Cover meat to keep it hot. In a small sauce pan, whisk together 2 Tbsp corn starch with 4 Tbsp water. Add about ½ cup of the liquid from the slow cooker to the sauce pan and heat over medium, whisking constantly add to slow cooker and heat until thickened. Place meat in the bottom of the slow cooker. Add vegetables (except for the peas). Top with tomato sauce and water. Boil peas for 4-5 minutes and add to the slow cooker. Shred meat and serve over rice. Place ground beef in the bottom of the slow cooker. Add all other ingredients on top. Cook on medium for 6 hours, or low for 8 hours. Slice onion and place on bottom of slow cooker. Cut ribs into halves or thirds and place over the onion. Add all spices and garlic on top of the ribs. Add the BBQ sauce and water. Cook on high for 4 hours or medium for 6 hours. Remove from slow cooker – If you want to crisp them pop them under the broiler for a few minutes. Add all ingredients (except the sour cream) into the slow cooker. Mix to evenly distribute the spices. Cook on high for 4 hours (or medium for 6, or low for 8). Remove chicken and vegetables from the slow cooker. Add sour cream to the remaining liquid and whisk. Cook on high for 4 hours (or low for 8, medium for 6). Shred with forks or a potato masher. Serve in taco shells and top as desired. Add all other ingredients on top and mix. Cook on medium for 6 hours, or high for 4 hours. Serve over rice and top with chopped green onions. I have had a few people ask me why I did not change my last name when I got married. I ask them back why did you agree to change your name? Before I got married I had a career, I was an established Human Resources Manager and I had recruiters calling me. I was known as Jessy Clifton, not Jessica Clifton, and certainly not by my boyfriends last name. I liked my name, I was never teased as a child because of my name, I have never ran into another person with the same name and I was not in a hurry to get rid of it because I disliked my last name. I don’t agree that women have to change their legal identity while men don’t have to change their identity when they get married. I did not want to have to change every bit of identifying information when I got married, credit cards, ID, Social Security, Bank Accounts, E-mail addresses, Business Cards, ugh the list is endless at how many things are personalized with your full name. I do not agree with the fact that historically slaves took on their owners last names and became a piece of their owners property. I see changing last names as an archaic tradition where women are now owned by their husband’s family. Should you take your husbands family name because you now are owned by them? Lets look at historical marriage ceremonies where the woman’s family gives 4 cows and 1 sheep to the husbands family to take care of her because women were not worth much more than animals. I chose my husband and my family did not give my husbands family any cows to get rid of me. I believe we need to question this tradition! It is archaic and unnecessary. I am still legally married but with my own name. When the priest announced us he said I would introduce the new husband and wife. I did not want to be introduced as Mr. and Mrs. John Johnson! Are you kidding me, not only does a woman loose her last name now she looses her first name and is just Mrs. John Johnson? Ick! How demeaning! Basically there were more reasons why I refused to have my name changed than why I would ever consider changing it to keep my husbands family happy. Before we were married my husband and I talked about the complications that might happen with separate last names, we have no problem having both of our names on bank accounts, house, insurance, cars. I agreed to allow our children to have his last name. Now here is where we have had problems. One time my husband was in the emergency room and I had to give them my name and ID to be allowed back to see him. The nurse gave me a hard time because I had a separate last name, she actually told me that I needed to have my marriage license to prove I was married. I told her I would have her job if she did not allow me to see my husband. Jon had tickets held at a will call and he was parking the car and told me to go in and get the tickets. The woman at will-call would not give me the tickets because I did not have the same last name. I said would you give the tickets to his sister? Not that it helped but hopefully I made her think about her process and I will make sure that he gets tickets in his name not me. Now that we have children, I have had a few moms question why my children have separate last names and if I am married to their father. I also tend to write on paperwork that I am their mother next to my name and next to my husbands name I write that we are married with different last names. I don’t ever want my children to be discriminated against because it appears their parents are not married by last names. I will make sure that does not happen. Why do I bring this up? I am surprised at how few women even consider keeping their last name and happily give up their entire identity in order to get married. I think hyphenated names are very 1992, but still give those women some credit for being forward thinking. I want women to think twice about why they are changing their last names just to get married when you will legally are still married with your own name. Pregnancy Tests- Dirty or Exciting? A friend was looking at my son’s baby book and laughed because I took a picture of the positive pregnancy test and put in the book. She said “I can’t believe you put that in there!” I said “Why not? I did not save the one I peed on, just a picture of it.” I am so grateful I took that picture, it was the first message I ever received from my little guy. That picture reminded me of all of the wonderful emotions that I experienced when I found out I was pregnant with my 2nd and most likely last baby. It occurred to me that not everyone looks at pregnancy tests as a wonderful notice that a new life has been created and that they have a joyful life changing event happening in their life. The pregnancy test has such strong emotions either way for women that it is a very powerful image. I think about the commercials on tv, advertising pregnancy tests are generally shown in the positive light. They are usually being marketed to women who want to get pregnant, not the women who would dread a pregnancy at that point of their life that are only looking for a concrete sign relieving them from the chance that they might be pregnant. When I look at the photo of my positive pregnancy test I remember thinking that I felt different. I was falling asleep when I was reading my daughter her book at night, I was starving at lunchtime and I felt a little bit crampy, I felt like I was pregnant again. I waited until I missed my period by 1 day, drove to the store and bought a two pack, took a pregnancy test right before bedtime, washed my face while I waited for the results, and looked down to see the digital display clearly saying the word Pregnant. I was surprised, and thrilled! I had been on the birth control pill up until I decided I wanted to have a baby and never purchased a pregnancy test to rule out pregnancy. I think if you had to take a pregnancy test if you were afraid that you might be pregnant, then seeing a photo of one would have a very different feeling. You might look at the photo of this pregnancy test as dirty and something you want to avoid. I could not imagine having to go the store after missing your period, buying a pregnancy test, going home, peeing on the stick, waiting for the test results, the agonizing wait to determine your destiny. When you finally see the negative pregnancy result you have a huge sense of relief. You would then and quickly eliminate the horrible pregnancy test from your view in order to get over that scarred feeling. I will continue to see pregnancy tests as a wonderful exciting messenger that can deliver great news. I hope that good women who dread looking at pregnancy tests because of a horrible scare in their lives will one day be able to have a wonderful experience with a pregnancy test when it tells them the news that they are thrilled to read. Being a bridesmaid in a friends wedding is a strange business. Your friend or relative asks you to be in their wedding and you are honored that they asked you (or else you feel bad for them because they have no friends) so you say you will be in their wedding. Now you just signed up for a whole list of obligations and if you do not make good on each and every one you will be considered the bad bridesmaid and friend. If you are the maid of honor your job is to pick up the slack of these bad bridesmaids and your costs double for each of the days below. Grooms Dinner- Sure you get a gift and a free dinner out of the deal and hopefully a sincere thanks from the bride and groom. Gift Opening- You are in the wedding so you are expected to attend the day after to watch them open gifts and be bored out of your gourd sitting around drinking mimosas and eating fruit. Cost – 1 Sunday. Wedding Total- $1,230 plus 8 days devoted to your friend the bride. For my wedding I purchased my bridesmaids dresses and jewelry. I realized that they might not have liked my dress choice and I knew how I hated the feeling of plopping down the full cost for a bridesmaid dress that I could not ever return so I wanted to do something nice for my girls. They still had to buy the undergarments and shoes, but I also made sure I only had one large shower because I wanted my friends to remain my friends and not spend months of their life devoted to my wedding. I am not a wedding hater, I am just practical. I also think that people need to consider the costs you are signing up for if you are asked to be in a wedding. If you are a bride, remember the costs your friends are spending on your day and in your honor. Try to pick out a reasonable bridesmaid dress or better yet, consider buying them for your bridesmaids! If you are still friends after their wedding, try to put the same friends who’s weddings you were in, in your wedding so you guys can pay each other back for the time and energy spent.